This beach ranks #3 of the "Best beaches in Oceania"
There are three hotels in the island: Nanuya Island Resort, Sunrise Lagoon Resort and Gold Coast Resort. Fly to Nadi International Airport (NAN). Get by taxi to the port of Denarau. 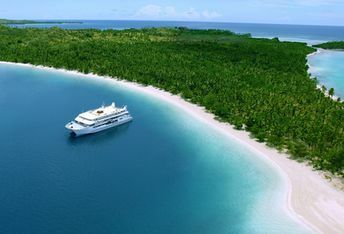 Next, use the Yasawa Flyer catamaran. For a reasonable fee you can visit several islands during the period from 3 to 14 days. Dayly tours to the Blue Lagoon are available with Blue Lagoon Cruises. There are also several ferry companies serving the region: South Sea Cruises & Captain Cook Cruises. Any time of year. Period from December to April is relatively rainy, but the sea water is warm and there are no crowds of tourists. High season in Fiji lasts from May to November.